however "old" Sutherland Springs rounds out at 0. Sutherland Springs was founded by a Dr. John Sutherland Jr. who set up a post office and stagecoach stop in 1851. 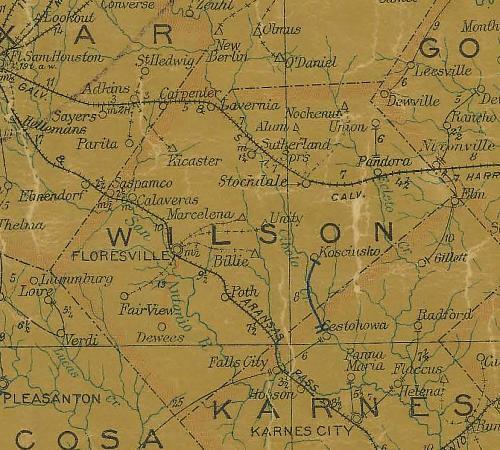 It was officially designated the County Seat of Wilson County in 1860, but folks were busy during the Civil War and when it was over, some people preferred Floresville as county seat and so it was. When the railroad came in 1877, it became known as the "Saratoga of the South" for its waters. Today what was Sutherland Springs sits just South and East of the highway. Two buildings spaced far apart are all that is left of the Old Town, although there are street signs. One of the buildings is the former bank. Hackberry trees (and poison ivy) now grow in the middle of the roofless room and the vault is still there with its cast iron ornamentation around the door. Sod farms have become a part of the local economy and the owners of the old 52 room Hotel Sutherland razed it to have soil to grow more grass. The building had been closed since 1923. Sutherland Springs was an extremely popular resort and there was a claim that within a very small area there were over 100 separate sulphur springs. The main bathing areas were by the river (Cibolo Creek) and the one with darker water was called "black springs" and was reserved for men while women used the "white springs". One legend has it that the waters of the Black Springs never froze. Attempts were made to bottle the water from Sutherland Springs and shares were sold; however no bottling plant ever materialized. The springs were popular with religious groups for holding revivals there and after 1917, the US Army contracted to have wounded soldiers from WWI recuperate there. Because of its isolation, trains were about the only way to visit the springs. During its heyday women and children would take a train to the springs during the week and then fathers/ husbands would join them on the weekend. Dear TE, I just discovered tonight that my great grandparents were living in Sutherland Springs in 1880. My great grandmother died in that year. I don�t know where she is buried. Is there a cemetery in the area? And are there any records of inhabitants and how long they might have been there? 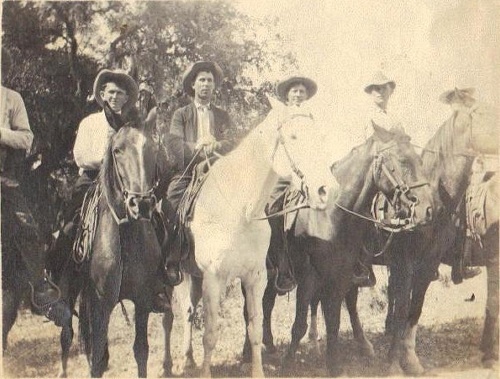 After her death my great grandfather moved the family to San Antonio, remaining until his five children were grown and married, and my mother was born. ( He ended up buried in Seattle but that�s another story.) Neither she nor my aunt, her older sister, ever mentioned the Springs. I don�t think they knew about it, or forgot it, in my aunt�s case. This is all new family history for me and I am quite excited. My great grandfather was Harvey Columbus Neal, a Confederate veteran from SC; his wife was Mary Louise Gee Neal of MS. They had moved to Texas from Tennessee to �help (Mary�s) father and brother John with a cattle drive�, and stayed, possibly for the climate - poor Mary died of TB. I wonder if they settled at Sutherland thinking that the waters would help her. i believe it was during the 1880�s that there was a house fire, destroying any family papers and pictures, so what info I have comes from the 1880 census, courtesy of the Civil War Trust. Texas Escapes, in its purpose to preserve historic, endangered and vanishing Texas, asks that anyone wishing to share their local history and photos, please contact us.